Writing swimming lesson plans can be time consuming, but it is an essential task to get right if you are going to deliver an effective, results based lesson. 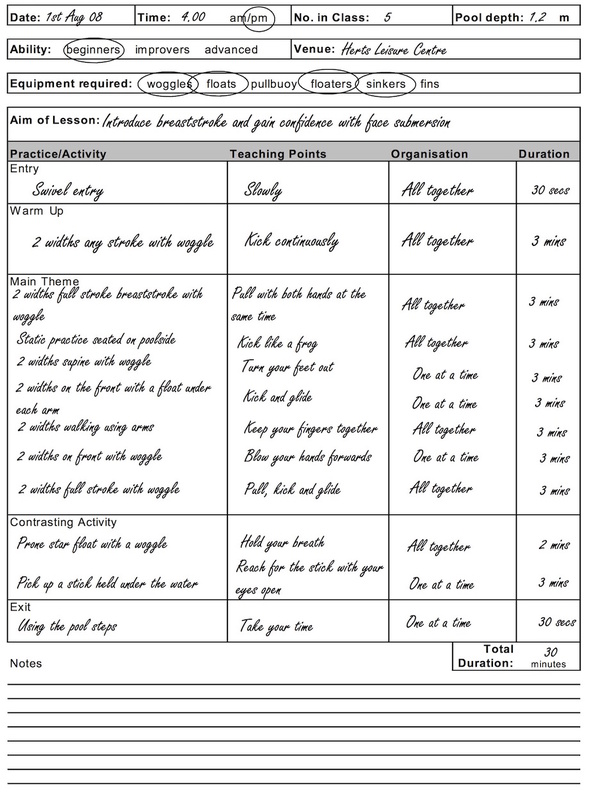 Here at Swim Teach, I have tried to make planning lessons a little easier by providing you with an example plan, along with a blank template for you to copy, print and use to plan your own lessons. Swimming lesson plans are essential to the success and outcome of even the most basic swimming lessons. The planning of a swimming lesson takes place in advance and helps the teacher to focus on the aims of the lesson ahead. Lesson plans help new or inexperienced swimming teachers to organise exercises and activities for the lesson as well as to gather equipment required prior to the start of the session. This then allows the lesson to flow uninterrupted from one activity to the next in a structured, professional way. What Should Swimming Lesson Plans Contain? The basic components of a lesson plan should contain essential information about the overall session, details about each exercise and an easy way to calculate the length in time of the swimming lesson. Date and time: the date and time of the planned lesson to be taught. Number in class: the number of pupils in the class. Pool depth: the depth of the section of the pool the lesson will be taught in. Ability: the overall ability of the pupils in the class to be taught. Venue: the name of the pool or leisure centre where the lesson will take place. Equipment required: all equipment including floats, buoyancy aids and toys that will be needed for all exercises throughout the lesson. Aim of the lesson: this can be anything from 'gaining water confidence' to 'improving butterfly technique'. The aim should be relevant to the ability of the class and the teacher's desired outcome. Entry: the type of entry into the water used by the pupils. This should be relevant to their ability and confidence levels. Warm up: the warm up should be a swim or movement through the water that is well within the class ability level and should last approximately 2-3 minutes. Main theme: contains the bulk of the lesson content and should be made up of practices and activities relevant to the aim of the lesson. The main theme should be the longest part of the lesson. Contrasting activity: this part can complement the aim and main theme of the lesson or introduce a new activity in preparation for future lessons. Examples of contrasting activities could be sculling, treading water, retrieving an object from the pool floor, star floats or diving (if the depth is safe). Exit: pupils can leave the pool via the poolside or the steps. Teaching points: these are the actual instructions given to the class, usually verbally, by the teacher enhance each practice. For example "point your toes", "keep your fingers together" or "kick from your hips". Duration: the duration of each practice or activity should be estimated and then added up at the bottom to give the total duration of the lesson. This ensures the lesson time is used efficiently and effectively and that classes do not run over time or are not long enough. The example plan shown above is available to download from the link below. It is a PDF file about 1mb in size and can be viewed on all mobile devices. I will not ask for your email address and you will not be asked to subscribe to anything. Simply click on the link and the file will be available in a new window. The file contains a copy of the example plan above and a blank version for your own use. CLICK HERE TO DOWNLOAD YOUR BLANK PLAN. Need Some More Planning Tools? 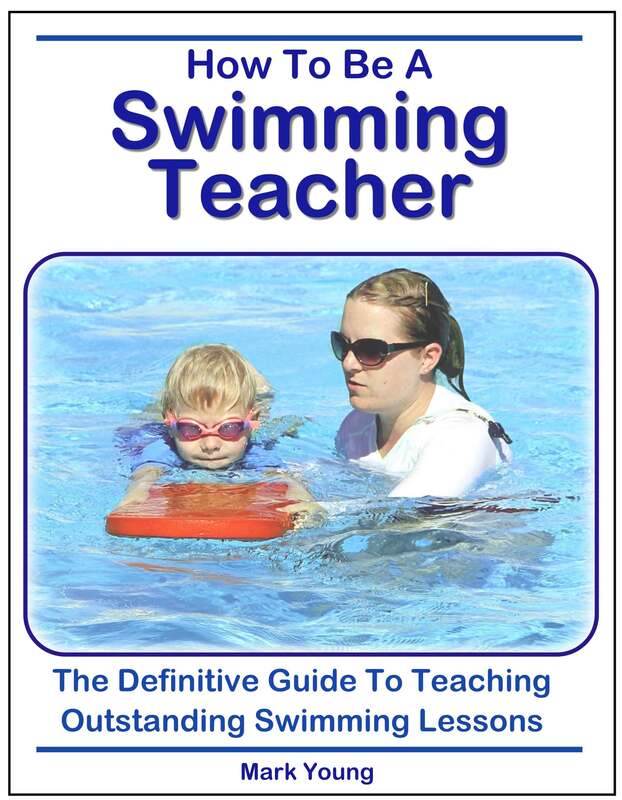 My book 'How To Be A Swimming Teacher' contains 82 separate exercises that can easily be slotted into your swimming lesson plans. You will also learn best practice tips and essential qualities that make up a swimming teacher of the highest standards. Discover how to deliver swimming lessons that get results with the definitive guide to becoming a successful swimming teacher. Click BUY NOW to download your copy, or click here for more information.